You are here: Home » D3 @ PSP: Welcome to the Neighborhood! D3 @ PSP: Welcome to the Neighborhood! 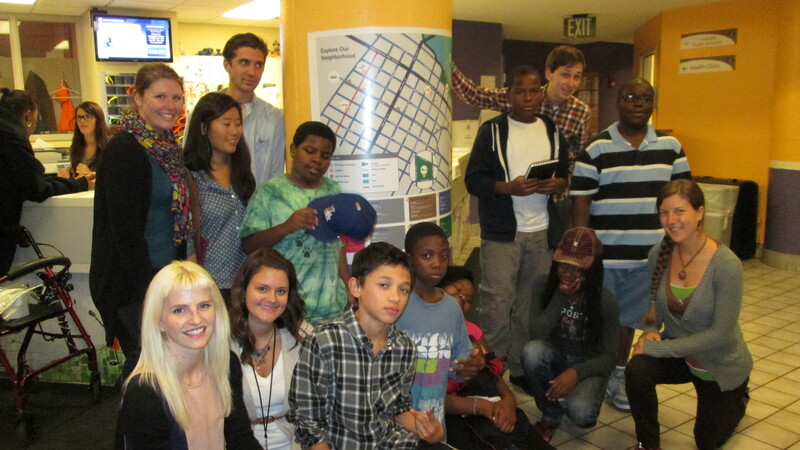 D3 presents their “Welcome to the Neighborhood” map to PSP guests. In the final week of creating a map for guests at PSP the teens let their special interests and talents shine. One young boy took center stage in front of PBS’ cameras to explain the D3 process, the whole map project they had been working on, and the final steps in collaboration with JOYCE ad agency. The final product was a 3.5′ x 3.5′ brightly colored, printed and lamented map to be mounted in PSP’s entrance lobby. JOYCE designers began the ground work of the digital map. Then the teens got in front of the computers and created the essential features and details. Worked hard and played hard! 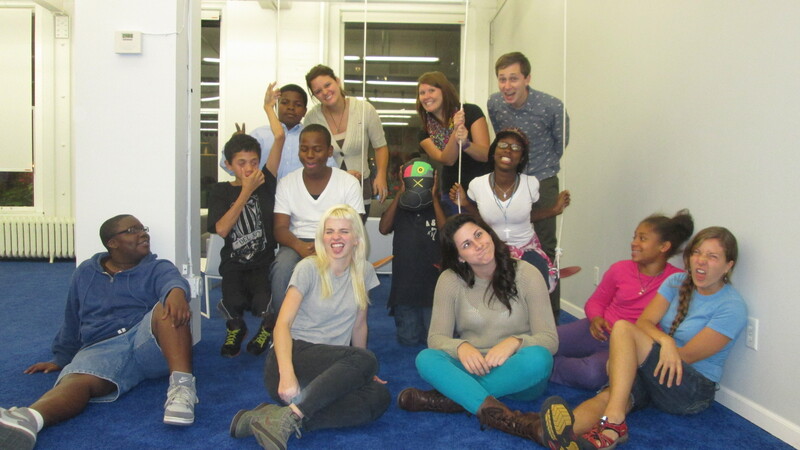 JOYCE volunteers combined all of the teens’ work and the very next day the teens celebrated their finished product! Hearing the many, “I did this!” and “I made that!” brought us all together in a successful collaboration. After a bit of celebration the teens gathered guests in the lobby to present and hang up the map they made and the presenter ran through the process and practiced what he would say to the crowd. Guests were WOWed. Everyone cheered and thanked the teens for their hard work and professional looking finished product. 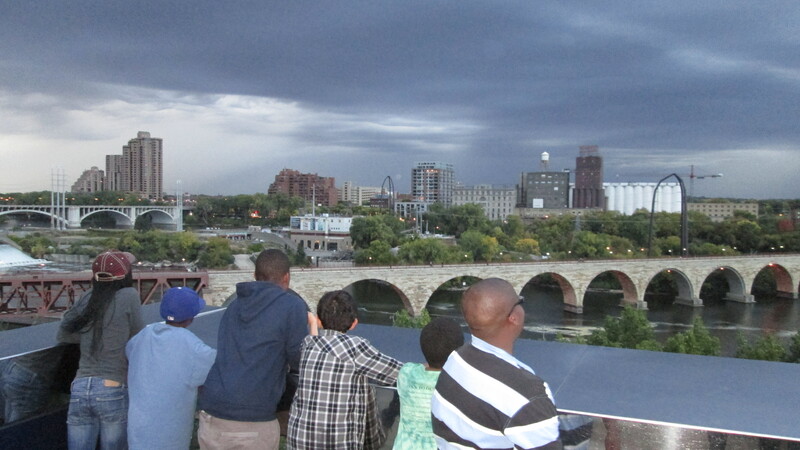 For reflection and a bit of reward we all walked a few blocks to the stunning Guthrie Theater, a sophisticated place as described on the Map. With focus and sincerity the teens gathered in a small circle, kept to near whisper voices and engaged in reflecting on the D3 process, what they learned, how they’ll use those skills again, and what could be better. Many responses to what the best part of the D3 process is were the Doing It phase! A few also mentioned how good it felt to create something that is really going to help others feel more comfortable and get where their families need to go. PSP’s entrance has a brighter vibe now with two D3 projects dreamt, designed, and done by teens hanging in the space! !